A foam is a substance in which gas is trapped in a liquid or a solid in pockets. There are many types of foams - for example, those used by firefighters (mostly to combat burning oils). A bread is also, at least formally, a type of foam. Graphene foams are usually made by growing graphene using a CVD process on a 3D metal foam (structure). The metal is then removed which leaves the graphene 3D foam. A graphene foam is strong and conductive and useful for many applications - sensors, purification/absorption materials - and more. Graphene foams are somewhat similar to graphene aerogels, in which the liquid part of the gel is replaced by a gas (usually air). Graphene foams are now available commercially, contact us for details. 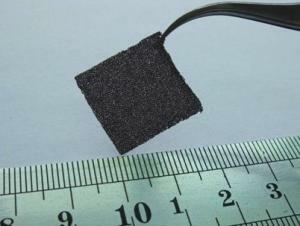 Rice University scientists have developed a simple way to create conductive, 3D objects made of graphene foam. The resulting objects may offer new possibilities for energy storage and flexible electronic sensor applications, according to Rice chemist Prof. James Tour. The technique is an extension of groundbreaking work by the Tour lab that produced the first laser-induced graphene (LIG) in 2014 by heating inexpensive polyimide plastic sheets with a laser. The laser burns halfway through the plastic and turns the top into graphene that remains attached to the bottom half. LIG can be made in macroscale patterns at room temperature. A research team from the Paul Scherrer Institute in Switzerland and Sapienza University in Rome developed a new loud speaker that is driven by a light signal - and without electricity. The idea is to use modulated light that shines on a 3D graphene sponge. The audio is achieved via a highly-efficient photo-mechanism. The researchers say that unlike conventional loudspeakers, this high-fidelity photo-speaker does not rely on vibrations to produce the sound - and it does not need any type of electrical connection or complicated system for sound generation. Using an optical pulse train, this loudspeaker allows a completely digital operation for frequencies from acoustic to ultrasound. 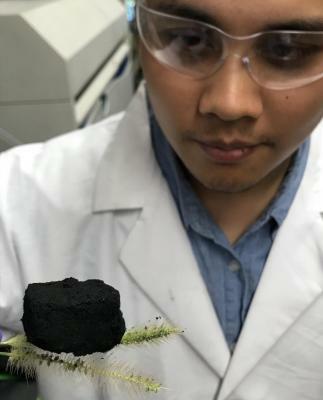 Researchers at Rice University have constructed a graphene foam, reinforced by carbon nanotubes, that can support more than 3,000 times its own weight and bounce back to its original height. In addition, its shape and size are easily controlled - which the team demonstrated by creating a screw-shaped piece of the material. The 3D structures were created from a powdered nickel catalyst, surfactant-wrapped multiwall nanotubes and sugar as a carbon source. The materials were mixed and the water evaporated; the resulting pellets were pressed into a steel die and then heated in a chemical vapor deposition furnace, which turned the available carbon into graphene. 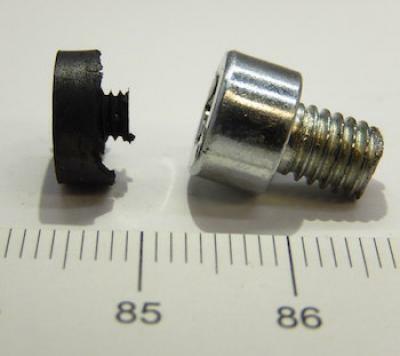 After further processing to remove remnants of nickel, the result was an all-carbon foam in the shape of the die, in this case a screw. The team said the method will be easy to scale up.